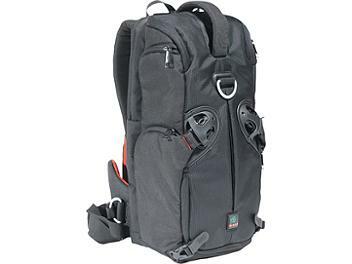 The Kata D-3N1-22 3 in 1 Sling Backpack, Medium (Black) is designed to fit a digital SLR camera body with battery pack, mid-range zoom lens attached, 3-4 additional lenses, flash, netbook computer and personal gear. The pack is made from reinforced Nycore grid fabric exterior with TST rib structures protection, Yelloop interior and smooth lining and an EVA and polyethylene closed cell foam interior. It has three carrying options in one; changing from sling to "X" position to backpack and back again. The bottom main compartment of the pack holds equipment and uses the modular dividers to custom fit the bag. The large top compartment will hold personal gear or additional gear and it has internal pockets and a MP3 player pouch. There is a computer section toward the rear of the sling bag. Two external zippered pockets allow quick access to accessories without opening the main compartments. In sling position, the bag easily swings around from back to front to achieve quick draw access to the main camera and extras lenses. In backpack position and "X" position, the equipment can be comfortably carried for long distances. The included balancing hip strap helps take the load of heavy equipment off the shoulders. The included rain cover folds neatly away into an integrated pocket and can be hung out to dry on the small buckle next to the handle, or tucked away for storage in one of the pockets.